It's a problem as old as time: How do I carry a backup slice of pizza without all the hassle and mess? Simple solution: the portable pizza pouch. This handy pouch allows you to carry a slice of pizza around your neck for, say, when you are running to a meeting and want your slice of pizza easily accessible, or when you have two slices of pizza but need both hands to eat one. 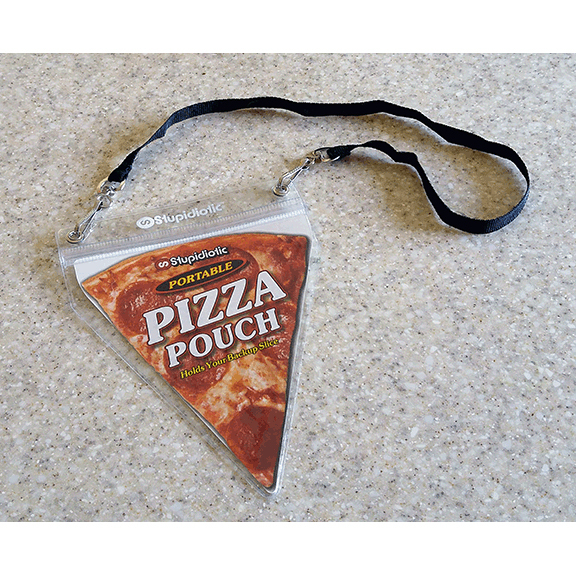 This pizza-lovers tool, which looks like a triangle conference lanyard, is selling for a whopping $8 on the aptly named site Stupididiotic. The product raises simple logistical questions like: Does the grease pool at the tip? Do you smell like pizza all day? What if you want a large slice, and what about us square-sliced Sicilian eaters? When will we have our day?